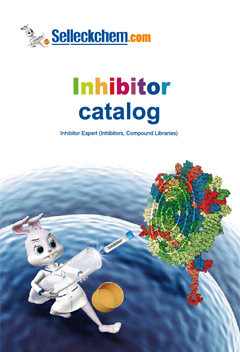 PF-04691502 is an ATP-competitive PI3K(α/β/δ/γ)/mTOR dual inhibitor with Ki of 1.8 nM/2.1 nM/1.6 nM/1.9 nM and 16 nM in cell-free assays, little activity against either Vps34, AKT, PDK1, p70S6K, MEK, ERK, p38, or JNK. Phase 2. BMDMs from WT animals were treated with different concentrations of PI3K inhibitors (500 nmol/L PF4691502, PI-103, BKM120 and 25 μmol/L SF1126) followed by hypoxia for 4 hours for Western blots. These macrophages were either used for lysate preparation (nuclear extracts for HIFα or WCE for pAKT and AKT) and Western blot analysis. 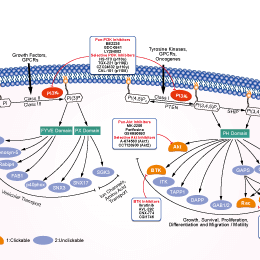 Mol Cancer Res 2014 12(10), 1520-31. PF-04691502 purchased from Selleck. Western blotting analysis demonstrating p-Akt and PTEN levels in hepatoma cells. Cells were treated with the increasing concentrations of PF-04691502 for 24 h. The expression of Akt, p-Akt, and PTEN protein were assessed by western blotting analysis in HepG2 cells and Bel7402 cells. β-Actin was used as an internal standard. Toxicol Lett 2013 220(2), 150-6. PF-04691502 purchased from Selleck. (A) A375 and A2058 cells were treated with ubenimex (0.5 mg/mL and 1 mg/mL) and combined use of ubenimex (1 mg/mL) and Akt inhibitor for 48 h, and the death rate was then detected using flow cytometry. Cells that are in late apoptosis or already dead are both Annexin V-PE and 7-AAD positive (Q2), (B and C) Autophagic cell death and apopotosis-related cell death (both A375 and A2058), showed by Q2 were measured together by flow cytometry. *P<0.05 vs control and #P<0.05 vs only with ubenimex (1 mg/mL). Data are presented as the mean ± SD of three independent experiments. Ub: ubenimex. Onco Targets Ther, 2018, 11:943-953. PF-04691502 purchased from Selleck. After starved in serum-free medium for 24h,A549 cells incubated with the indicated concentrations of PF-04691502 for 3h,followed by 20-minute stimolation of 100ng/ml EGF. Dr. Zhang of Tianjin Medical University. PF-04691502 purchased from Selleck. The fluorescence polarization assay for ATP competitive inhibition is done as follows: mPI3Kα dilution solution (90 nM) is prepared in fresh assay buffer (50 mM Hepes pH 7.4, 150 mM NaCl, 5 mM DTT, 0.05% CHAPS) and kept on ice. The enzyme reaction contains 0.5 nM mouse PI3Kα (p110α/p85α complex purified from insect cells), 30 μM PIP2, PF-04691502 (0, 1, 4, and 8 nM), 5 mM MgCl2, and 2-fold serial dilutions of ATP (0–800 μM). Final dimethyl sulfoxide is 2.5%. The reaction is initiated by the addition of ATP and terminated after 30 minutes with 10 mM EDTA. In a detection plate, 15 uL of detector/probe mixture containing 480 nM GST-Grp1PH domain and 12 nM TAMRA tagged fluorescent PIP3 in assay buffer is mixed with 15 uL of kinase reaction mixture. The plate is shaken for 3 minutes, and incubated for 35 to 40 minutes before reading on an LJL Analyst HT.